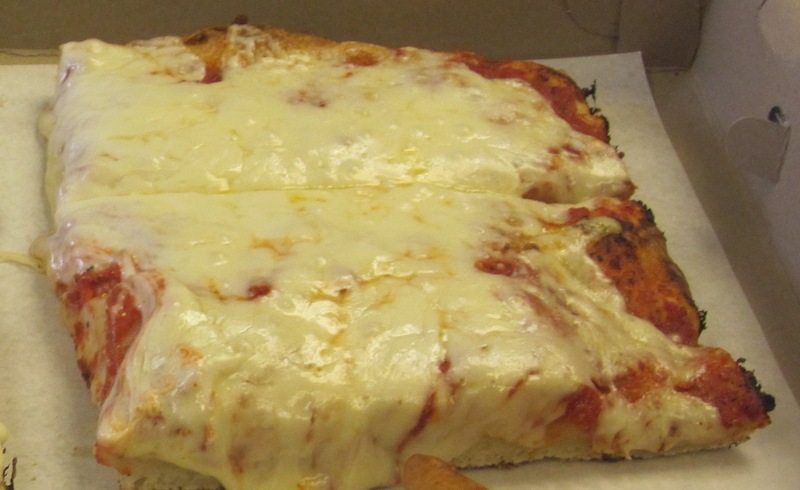 The array of pizza slices available at so many pizzerias here in New York is staggering. I usually just glance at them and wonder at the sometimes bizarre combinations. I judge a good slice on the basics; crust, sauce, and cheese. My pizza education was very specific. I was weaned on either “regular” or “Sicilian” slices. Despite my pizza purist upbringing, I’ve now learned to not totally disqualify a slice that is excessively decorated. I am a big fan of the “salad” pizza if done right. 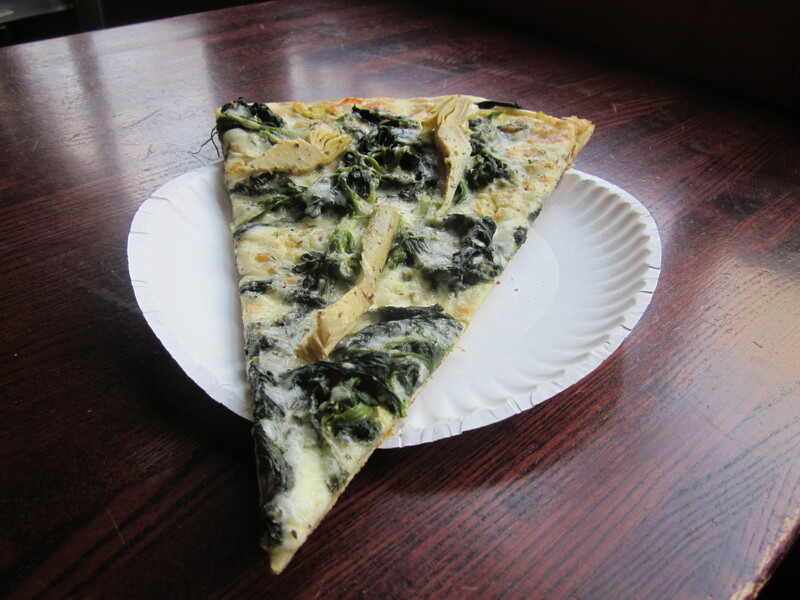 Louie & Ernie’s “white” slice is a Hall of Famer, as is the broccoli rabe pizza from Fratelli’s on Hunt’s Point (see A Slice of Ernie Ottuso Square and Bronx Broccoli Rabe From a Brother From Corona respectively). I strayed again recently and again in the Bronx, this time when admiring the pies inside the Full Moon Pizza on Arthur Avenue. 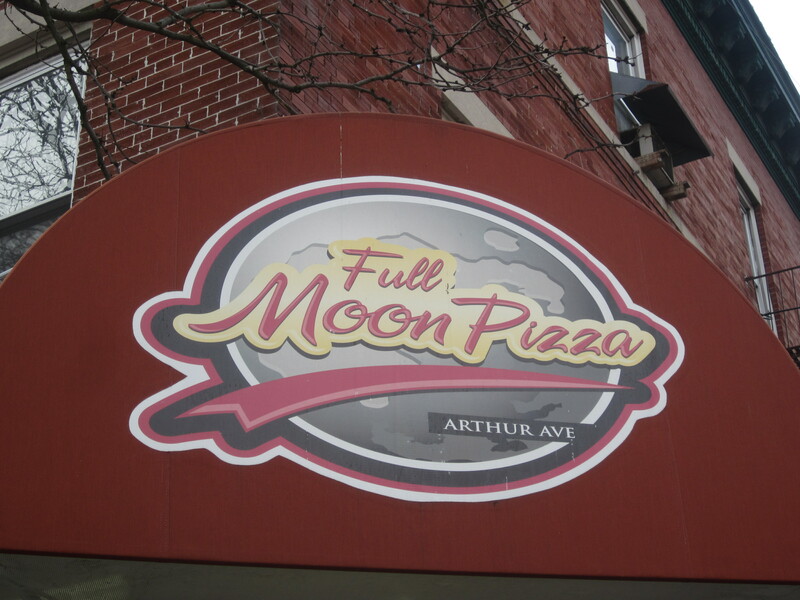 I first experienced Full Moon Pizza probably the first time I experienced Arthur Avenue. But recently I’ve stayed away; not because there was anything wrong with Full Moon Pizza, but preferring instead the mini-pies at Cafe al Mercato inside the Arthur Avenue Retail Market. The last time I was on Arthur Avenue, Cafe al Mercato was closed so I returned to the Full Moon. When I did, I noticed the artichoke and spinach pie under glass. I wasn’t sure how long the pie had been sitting under the glass, but the slice did have to be reheated, something I am very wary of. In this case, however, reheating did not diminish the taste. 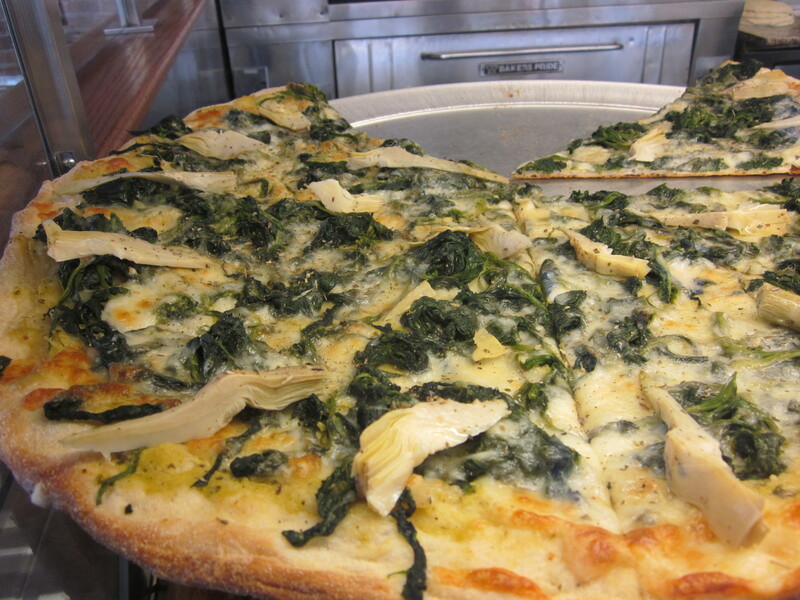 The spinach was tender, the cheese fresh, the crust baked perfectly, and the artichokes also tender and briny. But there was something else I tasted I could not identify. Something creamy, almost like another soft melted cheese addition to the mozzarella. I wanted to know what it was. The artichoke and spinach pie minus one slice: mine. Behind the counter there was a man in chef whites. I can’t recall ever seeing a pizza chef wearing whites…not even the legend, Dominic DeMarco from Di Fara wears them while preparing his pies. To the man in chef whites, who said his name was Sal (of course it had to be, see The Many Pizzas of Sal’s), I asked what went into the artichoke and spinach pie. “We use spinach, fresh mozzarella, imported artichokes, roasted garlic, and an artichoke spread,” he told me. So that what I was tasting that melded with the cheese: artichoke spread. Despite my traditional pizza sensibilities, I am against any rules on what can or cannot be put on a pizza. Some of those rigid Neapolitan pizza societies with the strict regulations on how big to make a pie; what type of sauce and cheese to use and how hot it should be cooked take it much too seriously. Not that I ever complain about the results. The addition of the artichoke spread was a welcome innovation. And I credit Chef Sal, if he was the innovator, with another revelation in my slowly expanding pizza slice world.